Kids Web India-A poratl for infants,feeding mothers,mother's corner,food of infants,breast milk,kids portal for parents,teachers. Contain ample of vitamin C, high fructose, antioxidant, helps to maintain immunity system, and can be eaten for diarrhea and gastroenteritis. Bananas are one of the nature’s ideal snacks containing high potassium and easy to digest and good popular solid food for babies. Un ripped bananas cause intestinal wind. Cabbage is rich in vit. C, K, E, and potassium. Beta-carotene, fiber, foliate, and thiamin, are also present. But it can cause flatulence and may cause iron deficiency if taken in excess. Both fresh and dried dates contain vitamin C. Dried dates are a rich source of potassium and a more concentrated source of niacin copper, iron and magnesium. 100gm dried dates contains 227 calories. Dried dates contain high sugar and can cause teeth decay and gum disease if eating it too frequently. Egg is the most popular natural inexpensive food provides protein, vitamin B12 and minerals for vegetarians. But it contains high cholesterol. An egg contains 6-8 gm of fat. A single egg yolk provides approx 448 mg of cholesterol. Most popularly used eggs are from hens. Other eggs used are ducks, quails and bantams. Most of the fish varieties are rich in protein, Vitamin B12 & D (for healthy nervous system) and Iodine (for functioning of thyroid gland). Many experts believe that the OMEGA 3 fatty acids in the fishes help to protect against heart and circulation problems. Omega 3 is always useful for the development of the eyes and brain and good for such disorders. However between smoked and pickled fish are not recommended as it may cause cancer if eaten to excess. Steaming, baking or grilling fish is good for health. Fish liver oil is excellent source of Vitamin A & D. 10 ml cod liver oil contain 1.2gm of vitamin A, 0.02g of vitamin D and about 2gm of omega 3 fatty acid more than enough for adult’s daily requirements. All varieties of grapes are rich in potassium and provide few vitamin and minerals. They are sweet and comparatively low fattening and 100 gm grapes contain approx 60 calories. Black grape contains antioxidants that may help to prevent cancer and heart disease. Special care to be taken for through cleaning because the dust, yeast pesticides and fungicides are often present in un washed bunches. Honey is generally sweet. But it flavor depends on which flowers are the bees have visited. Acacia honey is mild while chestnut honey is always bitter taste. The medicinal properties also depends on in which flowers the bees have visited. But honey is still considered as a remedy for chest complaint, especially for removing phlegm. It also has antiseptic properties and helps speedy cure of wounds. Honey can be used together with food or instead of jams, butter & spreads. Ice cream is one of the most favorite kid’s foods. It contains cream, milk, sugar and flavorings. The stabilisers and emulsifiers also may be added to increase its shelf life. It’s protein content is similar to milk and also have vitamins A,B2,B12 and calcium But it’s fat content is ranging from 5-15%. Diary ice cream contain milk fat only. 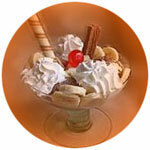 Both diary and non-diary ice creams contain saturated fat, which is not good for circulatory system and heart. 100 gm of ice cream contains 190 calories, 9.8 gm fat, 3.6 gm protein 24.4 gm carbohydrate, and 130 mg calcium. It is best to eat the low fat ice creams at low quantity and less frequently. Jackfruit is the biggest fruit,30-40 kg is not rare. There are 2 types of jack fruits viz.-Hard fleshed and soft fleshed. Hard fleshed is used as fruit and soft fleshed is used as a vegetable. Ripped fruits can be used for making jams. It contains 25 % starch and 1.87 %sugar and vitamin C etc. Jack tree’s wood is very hard and yellowish in colour and can be used for Doors, windows and furniture similar to teak wood or rose wood. Jack tree is native to India. Fresh lime is an excellent source of vitamin C, which helps to restore immune system and contains fewer calories. The practice of drinking lemon juice and a teaspoon of honey in hot water is widely used all over the world a remedy for cold and throat infection. However the high acidity may destroy the tooth enamel. Ripped mango is a rich source of anti oxidants, vitamin C and beta carotene which is readily absorbed by the body and converted in to vitamin A. The mango is rich in sugar viz. about 14% of its weight. The Alphonsa variety of mango is very tasty and superior in quality and a Native to INDIA. Best source of vitamin C and ONE fruit gives sufficient quantity of vitamin C for an adult’s daily requirement. It is an anti oxidant and also contains thiamin, folate vitamin B and pectin that lower blood cholesterol levels. Some people are allergic to citrus fruits and may develop a rash soon after eating them. Pineapple is a sweaty and juicy when ripped and having many medicinal properties. Gargling with juice is good for sore throat. It is also believed that eating of pineapple help to relieve catarrh, arthritis, bronchitis and indigestion. The latest research reveals that it contain an enzyme called bromelain which breaks down proteins. It may help to break up blood clots and therefore useful in the treatment of heart disease. It may also help to combat sinus and urinary tract infection. Rice is the main food for half of the world population. It contain excellent source of starch which provides energy and the protein Rice is the native of India or China and it is believed that it was cultivated there more than 6500 years ago. The best variety of rice is cultivated in INDIA –namely BASUMATI RICE-a long grain variety. The brown rice contains more vitamins, minerals, and fiber than white rice. Rice is easily digestible and slowly absorbed as it release the glucose slowly in to the blood and help to control blood glucose level. However the intake to be restricted by diabetic patients as it contain high quantity of starch. Shellfish is known as a fruit of sea and are rich in protein, low in fat, calories contain a host of vital nutrients like vitamins B1, B2, B12 and niacin, selenium, calcium, magnesium iodine and zinc. They are namely prawn, shrimps, crabs, lobsters, clams, oysters, mussels and cry fish etc. These can be cooked with various delicious dishes or cooked with vegetables or rise. Recent researches reveal that eating of shellfish tends to reduce the blood cholesterol level. All shellfishes prove to bacterial hazards. Care should take in buying quality shellfish and eating in moderation. Tomatoes are used in vegetable as well as fruit. Best in preparation of salads and equally best in preparation of soup, sauce, juice, and jam. Tomatoes are a good source of potassium, betacarotone, vitamin C&E, with very low calorie value.